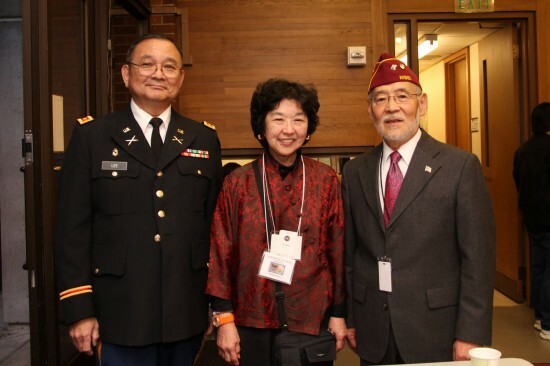 SEATTLE — Pacific Northwest Nisei veterans were honored at a Congressional Gold Medal celebration held Jan. 14 at Meany Hall on the University of Washington campus in Seattle. 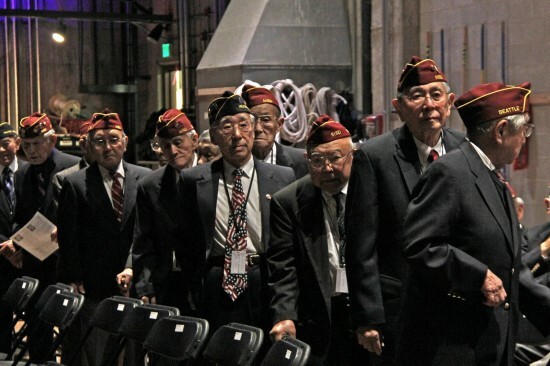 Organized by the Seattle-based Nisei Veterans Committee, this was one of a series of regional events held for those unable to attend the November 2011 ceremony in Washington, D.C., where the medal was presented to the 100th Infantry Battalion, 442nd Regimental Combat Team, and Military Intelligence Service. With more than 1,100 people in attendance, 63 veterans or family members received bronze replicas of the Congressional Gold Medal, and 15 also were awarded the Bronze Star. Only 17 honorees had attended the ceremony at the U.S. Capitol. The veterans were given a standing ovation as they were introduced by emcees Lori Matsukawa and Bob Kiga. The colors were presented by the U.S. Army I-Corps Command Honor Guard; NVC Commander Tom Kometani led the Pledge of Allegiance; the U.S. Navy Band played the national anthem; and NVC Chaplain Kerry Kaino gave the invocation. Gen. Peter Chiarelli, Army vice chief of staff, presented the Bronze Stars and gave the keynote speech. A graduate of UW and Seattle University, he related his connection to the Nisei veterans and often quoted Secretary of Veterans Affairs Eric Shinseki, former Army chief of staff. 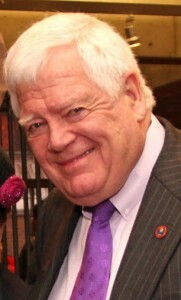 Chiarelli retired at the end of January after 40 years of service. U.S. Reps. Jim McDermott and Adam Smith presented the medal replicas with assistance from Yonsei volunteers. 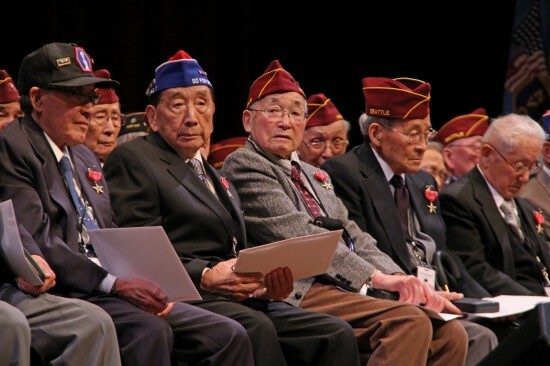 Both congressmen had voted to approve the awarding of the medal to the Nisei units in 2010. At the conclusion of the presentation, the band played “Aloha Oe,” a Hawaiian song of farewell played at many Nisei veterans’ reunions. Other VIPs included Maj. Gen. James Collins (retired), Washington state’s civilian aide to the secretary of the Army; Rear Adm. Douglas Asbjornson, Naval Region Northwest deputy commander; Consul General of Japan Kiyokazu Ota; State Sen. Steve Hobbs; State Reps. Sharon Tomiko Santos and Bob Hasegawa; King County Executive Dow Constantine; and Seattle Mayor Mike McGinn.